Few elements on a construction site are more dangerous than electric saws. Made to cut through plastic, wood, concrete, metal stone and other hard materials, electric saws can cut off fingers or even limbs. Unfortunately, despite known dangers, construction site supervisors and other parties sometimes urge haste in using electric saws. In some of the worst cases, supervisors may urge that safety bars and guards be removed for greater efficiency. Failure to properly care for electric saws is also common. Whenever a serious electrical saw accident occurs on a construction site, it is important that the injured worker thoroughly investigate his or her legal rights. 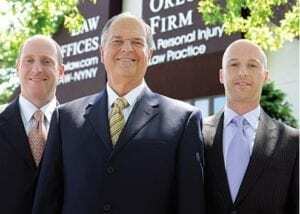 At The Orlow Firm, with offices throughout New York City, we can provide experienced help, counsel and advice. Were you injured in a cutting accident on a construction site by an electrical saw? The Bronx saw accident lawyers of The Orlow Firm have helped injured construction workers recover full and fair compensation for almost three decades. To contact us and schedule a free consultation, call (646) 647-3398. At The Orlow Firm, we can handle third-party claims involving saws and amputations, finger and hand injuries and other saw-related injuries. It is not your fault when safety guards flap upwards, building materials kick back and objects fly and cause injury. We can investigate your claim, work to identify all third party defendants and provide experienced and results-oriented representation. For more information or to arrange a no-charge consultation, contact The Orlow Firm for experienced personal injury representation. We offer free initial consultations and operate four offices across New York City for your convenience. We can go to you if you cannot come to us. To contact an attorney, call (646) 647-3398.